We can certainly understand that buying your first home in the greater Austin area can seem like a scary or daunting task. Having worked with many Austin area first time home buyers in the past, we also realize that there are going to be a lot more questions and a lot of more hand holding. We actually enjoy helping people buy their first home in the Austin area. It's all completely worth it when we are able to be a part of the excitement that comes with buying your first home in the Austin area. You will only buy one first home in your life, and we would be honored to be a part of this important life event. Your first home "wish list"
We also provide all of our Austin area first time home buying clients a FREE best selling book that is a must read for anyone aspiring to buy their very first home in the greater Austin area. 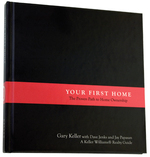 Your First Home is packed with inspiring stories and the wisdom of thousands of successful first-time home buyers. Not only does it educate readers of the home ownership process in eight simple steps, it also teaches readers ways to overcome less-than-perfect credit and how to implement successful creative financing strategies. Feel free to read a few excerpts from the book below.